This is a set with many questions attached, and the first one is simple: What on Earth is a 'shaab'? The answer, it turns out, is the word is the invention of Strelets. What they saw was in a Russian language book (and so rendered in the Cyrillic alphabet) and it was the old French word Chaable, which meant a catapult or machine of war. Not a word you find in English, so not a smart choice, but rather than find the correct spelling or a suitable translation they simply converted the word phonetically, and so caused confusion amongst those of us that genuinely can speak the language. 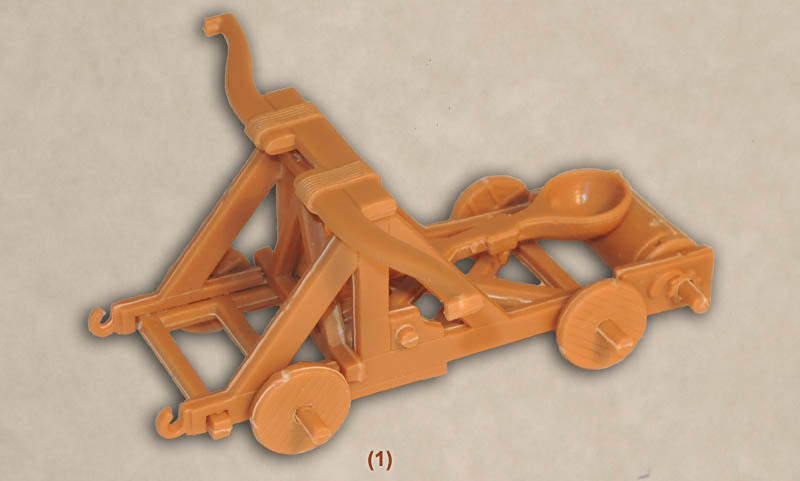 So, it’s a catapult, or to use a more specific common ancient term, an 'onager', which is how we will refer to it from now on. Question two is normally our question one: How accurate is this model? As we started researching it we soon found ourselves facing a third question: Did this ever really exist in the medieval period? Opinion is divided. On the one hand you will find several books and a few websites that show illustrations of this machine - not least the Funcken book from which the model was originally taken. They all have one thing in common - they provide no evidence of serious historical research to justify its existence (or, in the case of the book by Ralph Payne Gallwey, apparently fabricated). Some acknowledge it is speculative, but none provide any proof. On the other side of the argument are books and sites that look like they have done the homework, and all of those either dismiss the machine as highly unlikely or ignore it entirely. Of the books cited below Nossov says of onagers that their existence in the Middle Ages is "...extremely doubtful", while Gravett acknowledges that ones based on torsion (not like this model, which is based on tension) may have existed but says they must have been rare, and makes no mention of tension machines like this at all. This is because there is no firm evidence for such a device, just a handful of illustrations from the later Middle Ages (after the Crusades had largely ceased), and since there are many certainly fanciful illustrations of machines of war, and there were copies of Roman illustrations available, there is nothing to confirm they ever actually existed. Since no one today knows if they existed we are hardly in a position to comment on accuracy of course, and we are inclined to accept the lack of evidence as reasonable proof that they never existed, but a complete lack of proof does not guarantee something did not exist, so if you want to believe, be our guest. The onager here is a tension machine - it relies on the tension of the bow for the force, but the other piece of artillery in this set relies on torsion - twisted ropes giving the necessary energy for the bolt. In this case we couldn’t even find one source that backed up the Strelets implication that this ancient-looking machine saw service on the Crusades, or anywhere else in Western Europe, properly researched or not. On torsion-powered machines Nossov says they are "...doubtful", although both the Byzantines and Arabs had had some in their arsenals since well before the Crusades. A torsion machine did appear in Europe later on, and that was the espringal, but this model is certainly not an espringal. Oh dear. All we have left then are the figures. Dress-wise they are a very mixed bunch, with an assortment of widely-varying armour from different periods including one man in rather unlikely lamellar armour. Some have mail, some surcoats, some studded or padded jacks, which is OK when the description of the set covers around two centuries. The poses include some that are easy to understand (the two figures in the second row using the winch on the onager, men carrying ammunition), and a lot that are not. Several seem to be straining and pulling on something - presumably ropes - but where would these ropes be? The onager has the winch to retract the arm, and a similar device is at the back of the ballista, so what are they manhandling? One man has a large hammer. Perhaps he is about to knock away a chock in order to release the onager - that’s our guess at least. Another man seems to have a flaming torch in his hand, so presumably he is igniting some projectile for the onager. Although it is hard to see what many of the poses are meant to be doing, they are done reasonably well. The pair carrying the tray go together well enough and the poses are not particularly flat. Another question you might ask is how good is the figure sculpting, although if you did then you would clearly be unfamiliar with the very consistent standard Strelets have maintained over the years. The answer, as you might expect, is that the sculpting is the usual Strelets quite clunky and basic fashion, with enlarged and exaggerated finer items, so very much in keeping with the rest of their range. There is no flash and no assembly apart from the pair at the end, so there is not too much wrong from a production point of view. The two machines are made in a very hard plastic, and at least more effort has been made to make the connection between part and sprue slim enough to be snipped as opposed to sawn like some earlier models. The parts are a little rough in places, but we found with a small amount of strategic filing the onager went together well enough. The resulting model has wheels that can rotate (itself a big argument against the credibility of this machine) and an arm that can pivot, so is fairly decent, but things got a lot tougher with the small ballista. Some of the parts - especially the twisted rope - simply did not fit in the recess provided, which we discovered too late, hence the rather ramshackle model photographed above. Much worse was the front axle, which amazingly is provided in two lengths which cannot be made to join in the middle - they are not even close. The result frankly was a bit of a disaster and building them is not an experience we would recommend. Medieval Western Europe certainly did use siege machines, particularly after learning from the more advanced Byzantines and Arabs during the Crusades, but no one has shown that either of these machines were included. The figures are useful, however, although several need some large thing with ropes in order to justify their pose. As ancient machines these are actually a better match, although they still have issues even then, and anyway, didn’t Zvezda make a far better version of the same thing some years ago?